00:45:00 Makes 4 servings, 1/4 recipe (323 g) each. Makes 4 servings, 1/4 recipe (323 g) each. One-pot meals are always a hit in the KRAFT KITCHENS and this is one of our favourites. 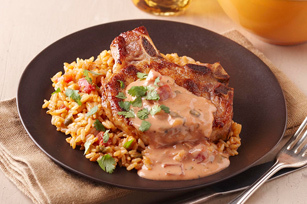 Pork chops are cooked with Mexican rice in this super stove-top skillet recipe. Sprinkle chops with seasonings. Heat oil in large nonstick skillet on medium heat. Add chops, seasoned-sides down. Cook 5 min. on each side or just until browned on both sides and done (160ºF). Transfer to plate; cover to keep warm. Add rice to skillet; cook and stir 1 min. Add water; bring to boil. Cover; simmer on medium-low heat 15 min. or until most of liquid is absorbed. Stir in half each of the salsa and Velveeta; top with chops. Simmer, covered, 5 min. or until liquid is absorbed. Meanwhile, microwave remaining salsa and Velveeta in microwaveable bowl on HIGH 30 to 40 sec. or until Velveeta is melted; stir until blended. Serve chops over rice; top with Velveeta sauce. Garnish each serving with 1 Tbsp. chopped cilantro or green onions. Serving Size Makes 4 servings, 1/4 recipe (323 g) each.